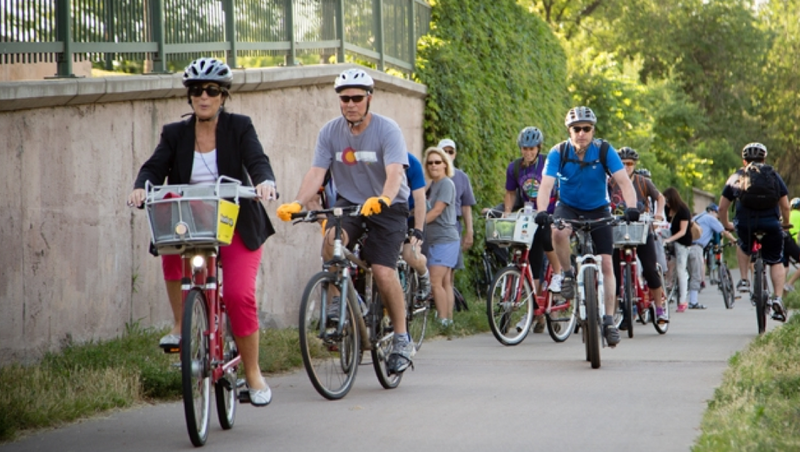 Wednesday is Bike to Work Day in Colorado, which means a lot more people than usual will be commuting by bike. The Denver Regional Council of Governments (DRCOG) expects about 34,000 bike commuters in the greater metro area, compared to about 18,000 on a typical day. Thanks to the safety-in-numbers effect, that probably makes it one of safest days of the year to bike to work. There’s also a bunch of stuff happening Wednesday, including 92 rest stations for bike commuters in Denver alone. Whether you’re a seasoned bike commuter or trying it out for the first time, there will be something extra going on for you on Bike to Work Day. DRCOG, the regional planning agency that puts on Bike to Work Day each year, uses the event to better understand travel behavior, and it collects data on who participates and where they bike. You can aid those efforts by registering and taking surveys about your bike commuting experience. Registering puts you in the running to win bike gear and tickets to concerts and sporting events. Not quite sure you want to venture forth alone? Join a group ride. Check the rendezvous points for each city. Also, DRCOG is partnering with Strava to create a data visualization of actual bike routes on Bike to Work Day, so if you bike on Wednesday, consider logging your trip in Strava to contribute to the map (as long as you are logging a bike trip in DRCOG territory, your cycling trip will be assumed to be a part of Bike to Work Day). This is a unique opportunity to actually see user routes, rather than simply assuming user routes based on origin and destination city and zip.